Styled in black, the Klipsch Reference Over-Ear Headphones have been designed to provide clear, crisp, and accurate sound that will not fatigue your ears over time. They provide a 40mm dynamic moving-coil driver which delivers a frequency response of 15 Hz to 20 kHz. 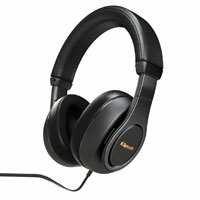 With removable memory-foam cushions that are deep and soft, these over-ear headphones offer both a comfortable listening experience and an accurate one; patented Klipsch Balanced Dynamic drivers equalize the weight of the unit's diaphragm, eliminate the need for lead wires, and aim to reduce intermodulation distortion. All of this contributes the articulation and clarity of the sound.